ABOVE: 2015 Show floor, with over 7,000 exhibitors from 108 countries and over 160,000 visitors. Anuga (Allgemeine Nahrungs- und Genussmittel-Ausstellung, translating to “General Food and Drink Trade Fair”) is held every other year in Germany and is the world’s largest and most important food and beverage trade show. As such, it holds a tremendous opportunity for Balkan companies and REG exhibitors. Most agribusiness companies in the Balkans have limited internal capacity for in-depth analysis, an understanding of consumer insights, and market dynamics. The majority do not have well-developed marketing strategies or a targeted marketing presence on key export markets, so most of the time their export decisions are based on personal conclusions from traveling to target markets or direct contacts. At the same time, fresh fruit and vegetables producers from the region struggle to identify and approach the right contacts, generate interest, and negotiate with potential importers. Participation in Anuga 2015 helps to bridge this divide. In order to optimize participation at Anuga 2015 REG Project contracted an international expert-consultant to work on detecting potential interest from buyers and assist 36 Balkan companies to meet potential buyers at the Trade Fair. REG coordinated with the organizers of National Stands for Serbia, Macedonia and Kosovo as well as all other relevant stakeholders, donor projects, export promotion agencies, and chambers of commerce from the region. Profiles of all exhibiting Balkan companies were sent out to about 100 potential buyers, inviting them to visit the Balkan stands. REG Project assisted Balkan exhibitors in scheduling pre-arranged meetings, establishing relevant contacts, presenting their companies to potential buyers, managing existing customer relationships and developing new business. Participation at Anuga 2015 was also an opportunity to enhance understanding of the competition, current market trends, and exchange experience in marketing with more advanced companies from the EU. It also enabled access to the most recent knowledge, new improved technologies and management practices that can be adopted for improving productivity and enhancing competitiveness. Overall, the assistance REG provided to companies exhibiting at Anuga 2015 was substantial and much needed. Contacts with key importers, produce marketers, consolidators, and wholesalers should lead to creating potential new export partnerships and strengthening links with existing customers. Based on established business contacts, several exhibitors reported interest in new orders from potential buyers at the trade fair. It is expected that a majority of REG exhibitors will have improved commercial success based upon their participation. In response to the opportunity identified during the regional product development effort delivered in 2014, REG developed the Learning by Doing model. Based on the product cluster framework, Learning by Doing aims to create new programs and activities that can best meet the demand for connection between adventure activities for guests related to the region’s cultural and natural attractions. The model seeks to develop opportunities for visitors to take an active part in cultural learning experiences. The distinguishing feature of the Learning by Doing is the intense mentoring provided throughout the development process offering continuous skill transfer and capacity building for the product cluster. Delivered in three stages it is based on collaboration of one or more tour operators, with a number of suppliers including: accommodation providers; specialized activity providers; attractions; local culinary outlets; and many others. As the final stage of the development process the new offers are introduced through sponsored training retreats offered to other businesses from the Western Balkans region. Thus the retreat becomes an opportunity for businesses from throughout the region with potential and interest to launch similar niche programs to experience the new offers and learn directly from cluster members key steps in putting the offer together. At the same time the incubator clusters themselves benefit from operational experience, networking and feedback from participants. The first Learning by Doing pilot was implemented in the area of wildlife conservation. The initial series of meetings with potential stakeholders communicated the main concept and the desired outcomes. Management of the Mavrovo National Park in Macedonia showed high interest and readiness to invest resources into developing a wildlife program. The town hall meeting held on 25 June 2015 officially launched the first Learning by Doing pilot, attracting colleagues from other protected areas in Macedonia, Albania and Kosovo. The intense product development efforts that followed encompassed two national parks (NP)– Mavrovo and Pelister and included assessment of the existing infrastructure needed and skills assessment, that then led to repair and building work on hides in the selected locations delivered by the NPs, and targeted training delivered to the key national park and other service staff. In addition to rangers and guides undergoing the Leave No Trace training, for the first time a cross training was developed and implemented between national park rangers and tourist guides – each group offering training on their core skills to the other group – thus establishing a group of specialized tour leaders that can respond to the specific needs of this niche visitors. In addition, key administrative solutions were developed for the future tour, including guest kit information sheet, and medical questionnaire and waiver for all guests to complete and sign prior to joining the tour. In early November (6-9 November 2015), the primary tour operator Gorki Wildlife Tours hosted the first Bear Tracking and Conservation tour. The tour offered an opportunity to a group of 15 representatives from Macedonia and the region (Albania, Kosovo and Serbia) to get acquainted with the tour – be it as a program to include in their future offer or as an example of how to develop wildlife programs at their home locations. The group included tour operators, other protected areas, NGOs active in wildlife preservation, regional offices of WWF and freelance guides. The second Learning By Doing pilot is implemented with the goal to mobilize the unique gastronomic and culinary heritage as a high end culinary tours and courses. The initial assessment of interest highlighted high readiness by Trebinje (Bosnia and Herzegovina) local community, both private and public, to pursue development of a new gastronomy based program. 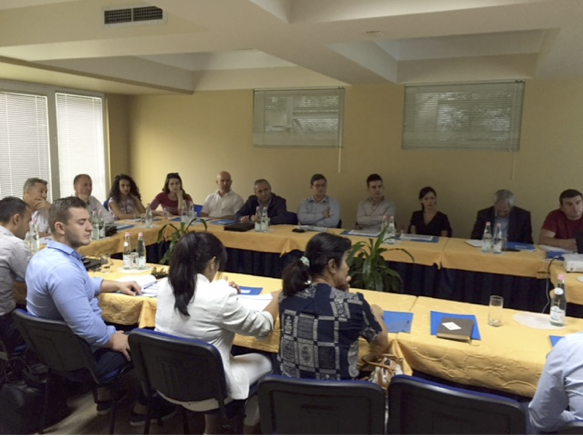 Following the model of the Learning By Doing process the wheels were set into motion with the town hall meeting held in Trebinje on 22 September 2015. The product development stage involved one to one and group consultations with individual operators, NGOs and small businesses that included herb collecting and oil producing operations, local Slow Food chapter members, traditional water mills and rural accommodation and locally run small hotels, as well as several traditional vineries. The Gastronomy and Culinary Retreat as the final stage of the product development and delivery was hosted by Colours Agency from 14-17 December 2015. On November 27th 2015, REG project supported the 5th meeting of the Balkan and Black Sea ICT Cluster Network in Skopje. For the first time there were 21 participants present from Albania, Bosnia and Herzegovina, Bulgaria, Kosovo, Macedonia, Montenegro, Romania, and Serbia. Joint EU project proposals, quality standards, certificates and joint trade missions were just a few of the numerous regional topics discussed. Upcoming EU funding schemes were explored and joint consortia between members in the network were planned. So far, the network has jointly submitted 5 different project proposals and gained one. On October 21st in Gothenburg, Sweden a B2B event took place with the support of REG USAID Project where 9 Macedonian and 8 Serbian ICT companies met with Swedish companies of the Business Region Gothenburg ICT network. A representative from MASIT (Macedonian ICT Chamber of Commerce) and a representative from the Serbian ICT Cluster Network were part of the Western-Balkan delegation. On October 22nd, the Balkan delegation joined the Lindholmen Software Development Day conference where over 600 Swedish companies were present, and even more contacts were established. This initial activity set up a foundation for several upcoming meetings and events organized or supported by the Business Region Gothenburg ICT network. REG has begun a long-term dialog and is expanding the list of potential joint activities for 2016. Several thematic conferences are planned general events both in and outside Sweden where more critical relations will be established between companies and organizations. REG Project continuously supports measures by which companies can become more competitive in their exporting activities. In September 2014 REG initiated a call for applications between all regional BSOs (Business Support Organizations) and companies for grants for quality standards and/or certificates. The standards and certificates REG supported are: ITIL, ISO 20000, ISO 27001, CMMI and SCRUM. 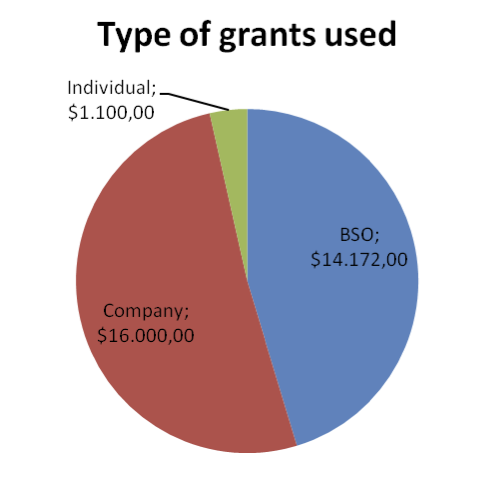 The 3 mechanisms through which one could apply for grants are: i) on individual level ii) a company level and iii) on a BSO level. The cost-shared amount by REG was up to 35% of the cost of the certificate. 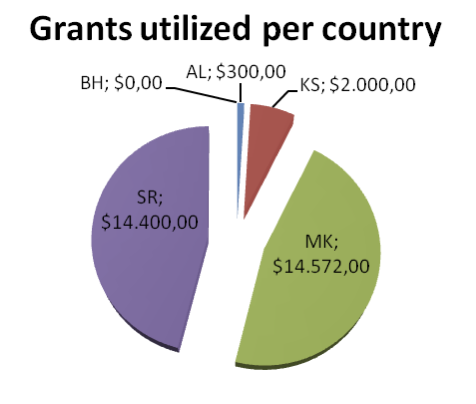 The beneficiary countries of REG project are: Albania, Bosnia, Kosovo, Macedonia and Serbia. 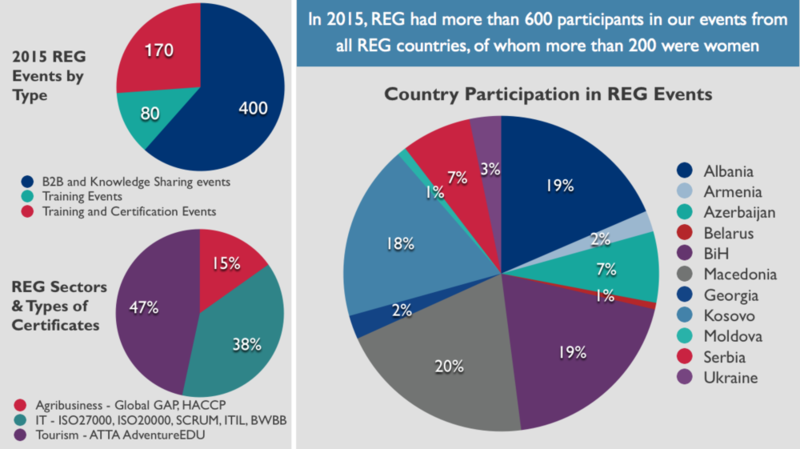 In the charts below you can see how much co-funding REG has provided per country, and per mechanism in the given period September, 2014 – December, 2015. Given the fact that this was the first round of co-funding, REG will continue this activity in 2016. In response to the weak promotional effort for the region’s new and existing tourism potential, specialized PR and marketing support was deployed between May and October 2015. The main goal of the effort was to build recognition of the Western Balkans as a travel destination through consistent, continuous and targeted efforts. To launch the effort a joint Action Plan was developed through a series of consultations with the core group of stakeholders, primarily the Western Balkans Geotourism Network and the Via Dinarica Alliance. It addressed areas of social media communication and identified the development of pitches for new or innovative product stories. To assist the stakeholders in how to lead and manage their social media effort “Quick Hit Social Media” and “Media Communications Guidelines” have been developed and distributed. Additional skill development workshops were delivered as an integral part of REG lead events, among them the town hall meeting in Mavrovo (as part of the Wildlife Conservation Learning By Doing pilot) and the regional B2B activities adjacent to the AdventureEDU in Kosovo at the start of June 2015. In addition to the support provided for stakeholders, a special effort was dedicated to promotion through social media outlets. Follower numbers across all forums—Facebook, Instagram and Twitter—achieved double and triple-digit percentage increases. The main section of the PR and marketing support was delivered during the high season months, which limited the amount of effort requesting direct stakeholder involvement, and allowed for a higher focus on development and placement of travel stories. A total of 24 stories have been published or are awaiting publication (at a publishing rate of 1.5 stories per week). The stories mention every country under the REG regional umbrella. By conservative estimates the publication of these stories translates to at least $60,000 value of FAM trip costs. The 15 stories that ran in Paste magazine hit a potential audience of more than 6 million readers per month and some 15 million page-views. All the articles also received multiple mentions on Paste and Paste Travel’s social media pages—very important for a continued, editorial conversation. The New York Times (where four regional stories have been placed or have been assigned awaiting publication) has a potential audience of some 40 million readers and 670 million page views. Each full-page story in The New York Times has an estimated ad value of just over $162,000. These four stories represent approximately 650,000 in ad dollars for the region. Along with the travel stories placed in travel media, the regional cooperation provided an opportunity for a strong push to promote the region and its flagship products in French market. The region has seen increase in number of visitors from France for several years now, led by Croatia and Albania. Initial French interest in coastal resorts about a year ago started to spill over to the inland areas of the region. Further presence in the French market was achieved through placement of Via Dinarica (and thus Western Balkans) information, at influential, French i-trekkings.net website. To support the information flow within the region, the Western Balkans/Via Dinarica newsletter, was launched with the aim of communicating development and market-opportunities within the stakeholder group. All major importers/traders of food products insist their suppliers conform with the safety requirements for both raw materials (primary production) and processed goods. In order to assist farmers, processors and cold store operators to the meet the prerequisites and get closer to export markets, REG Project in partnership with TUV Austria and local partner in Albania CBS (Customer Business Solutions) organized training workshops on key quality standards including Global G.A.P., HACCP and ISO22000. The Global G.A.P. (Good Agricultural Practice) standard is designed to reassure consumers on health and safety production practices on the farm by fully controlled and reduced use of chemicals and pesticides, protecting the health of farmers and other food operators’ as well as animal welfare and minimizing detrimental environmental impacts of farming operations by introducing sustainable production. During September and October REG Project engaged TUV Austria experts to conduct three advanced one-day trainings in Lushnje and Tirana Albania on the importance and implementation of Global G. A. P. principles. One hundred and twenty-seven farmers, and other producers, implementing consultants, auditors from certification bodies, lectures from agriculture universities, and agriculture specialists attended the training and gained the TUV Certificate "Training for general requirements for management practices on the farm according to the Global G.A.P." The same training was repeated in Strumica, Macedonia on the 7th and 8th November where 29 farmers and producers got trained in Global GAP and learned how to identify control points and resolve specific situations in fertilizers use, irrigation, integrated pest management, plant protection on a farm. Participants were guided by the Global G.A.P. expert through the checklists to confirm and/or detect non- compliance with the standard. Global G.A.P. training for Serbian farmers was held for on 15th and 16th of December in Vladicin Han, in southern Serbia where the largest production of berries and fruits come from. 38 participants were present. The training will enable producers to supply supermarket chains and export buyers with healthy fresh produce, safeguard their own well-being, as well as act consciously in terms of protecting the environment through sustainable agricultural production. In parallel, REG Project together with CBS, coordinated several TUV Austria trainings on food safety and quality standards for Agribusiness companies in Albania. At the end of October the project carried out three trainings in Lushnje, Tirana, and Korcha on the ISO22000 standard and traceability requirements. At the beginning of December, companies participated at two trainings on HACCP (Hazard Analysis and Critical Control Points). During the five trainings, a total of 96 processors, cold store operators, consultants and auditors improved their capacity to adopt food safety & quality principles and received the TUV Certificate for ISO22000:2005 and HACCP respectively. With the new gained knowledge, the companies will be able to approach more demanding markets and successfully supply processed products to larger retailers in the region and in targeted international markets. A regional B2B event, funded by USAID, focusing on Women in Business was organized with the goal to further support development of entrepreneurship among women. The event was organized at ICT HUB, the have tremendous potential to contribute to growth in their economies and societies” After numerous educative training sessions organized in business incubator for technological entrepreneurship, locally supported by HD European consulting group, representatives of CEED Serbia and the Association of Business Women in Serbia. Ms. Aneda Ward, Financial and Administrative Management Office Director of USAID remarked of the project, “We have focused on working with female entrepreneurs because of the specific issues they face in starting and growing businesses...Through our work with women’s empowerment worldwide, we have seen that women Subotica, the attendants had an opportunity to learn more about the kind of financial support and conditions that are available to women entrepreneurs in Serbia. Success stories were shared among participants, in order to help them to overcome their problems and to provide some useful guidelines for improving their businesses. Women entrepreneurs from Serbia, Macedonia and Kosovo, through meetings, managed to network amongst themselves and agree on terms for mutual cooperation to contribute to the development of the region. In October and November, REG organized two TRACTION Camp events for advanced early-stage technology startups, aimed at augmenting the business development, sales, marketing, fundraising, and strategic planning activities of the participating companies. The first event was held in Odessa on October 27-29, and was aimed at companies from Belarus, Moldova, and Ukraine. The second one was held in Tbilisi on November 27-29, aimed at companies from Armenia, Azerbaijan, and Georgia. At each event, each company was represented by one founder. In Odessa, founders of 28 companies representing Belarus (6 founders), Moldova (6 founders), and Ukraine (16 founders) spent three days working under the mentorship and guidance of 7 experts that REG invited to the event. The Odessa event was further supported by local Odessa organizations GeeksLab (startup incubator) and WannaBiz (startup accelerator and venture fund). Since TRACTION Camp Odessa, at least 5 participating companies have reported headcount expansion with more than 3 people, at least one company has reported raising USD 50,000 in external funding, and one company has won a scholarship from the prestigious IE Business School in Madrid. In Tbilisi, REG invited participants to apply from Armenia, Azerbaijan, and Georgia, collaborating with local organizations TechTension.am (entrepreneurship news resource, Armenia), Microsoft Innovation Center ( Armenia), Khazar Ventures (investment fund, Azerbaijan), and the governmental Georgian Innovation and Technology Agency. The event in November in Tbilisi was hosted by the Georgian American University, welcoming 30 founders; 16 from Armenia, 6 from Azerbaijan, and 8 from Georgia. Since TRACTION Tbilisi took place last month, three participating companies have reported to be expanding their teams with at least 3 new members, two companies have applied to international accelerators, and four companies have reported to have started fundraising with angel investors.